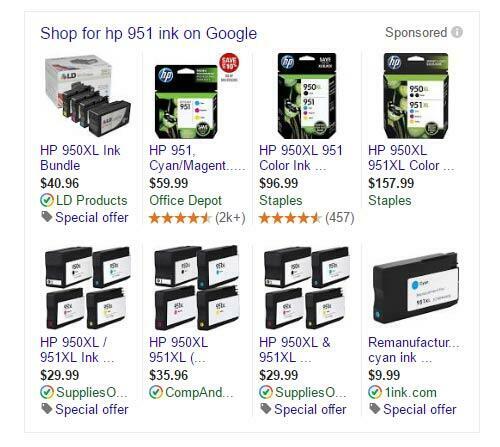 We all know how expensive printer ink can be. In fact, it’s almost as expensive as buying a brand new printer! Needless to say, buying replacement ink is an expensive endevour. There’s a couple of things to keep in mind before you go shopping for replacement ink. One really important one is to check for the ink cartridge’s yield. This is the amount of pages you can expect to print with that cartridge. This could vary from 150 sheets to 2300 or more. Your black ink will be used more than the color ink (if you have them) – so often manufacturers will sell a slightly larger cartridge for it. So while you think you’re getting a “great” deal on a cartridge – the page yield could be low. Another item you’ll need to note is whether you have a laser or inkjet printer. 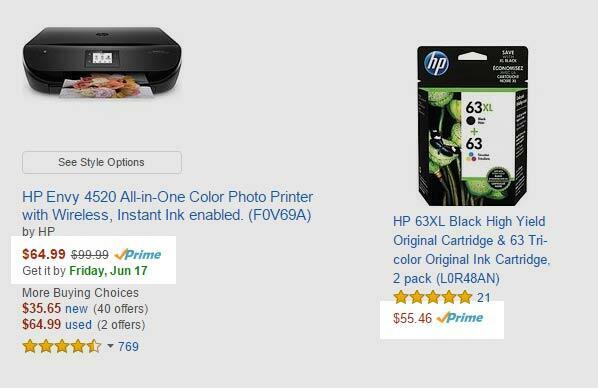 Most folks have inkjet printers because they tend to be somewhat cheaper than laser printers. But this is obviously changing over the years. You’ll typically get better yield with laser printers – but could be spending more per cartridge. Lastly, it’s important to know your printer model and what type of ink it takes. Many of them have an identifying number associated with your printer. For example, my printer is the HP Officejet Pro 8600 and it takes 951 (color) and 950 (black) ink. Since I’m using my HP printer as the guinea pig in my research – my findings and what I’m able to do here may be a little bit different than what you can do with your printer (assuming it is a different model than mine). But, you can certainly take my process for finding the best deal. Like usual, most of my shopping research begins online. I went ahead and checked out Amazon to see what they were listing the name brand ink at as well as any off-brand selections. I came up with $110 package to refill all inks (most of the time it will be that you’re replacing all the colored inks OR just the black as the sizes vary like I mentioned and use is different). So, this amounts to about $27.50 per cartridge. The yield is pretty good – but I knew I could be getting a better deal. I continued on to do a Google search next. All I really needed was the three colors (C M Y) this time around. Prices were getting better. 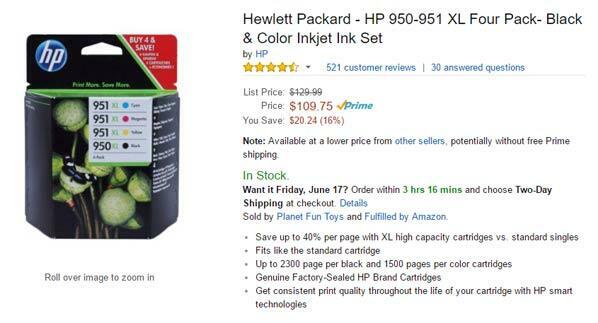 I see that Office Depot had my ink for $60, which means it’s about $20 per cartridge. Not bad. But I also started to see these “remanufactured” brands. Prices were considerably cheaper – but I thought I remembered hearing about folks having problems with these types of inks and was unsure if they’d work in my HP. I dug a little deeper and from what I was reading, many people were happy with their remanufactured inks. I had also heard about others taking their empty cartridges to places like Walgreens and Costco to refill their inks. “Could the printer actually accept these?” I thought. Since we are members at Costco, I thought I’d check ’em out first to see what the price would be to have them refill ours. First thing I did was checked to see if they refilled mine – and lo and behold, they did. I really thought this was a fair deal and I soon found myself grabbing my empty cartridges and hoping in the car, on my way to Costco. I got there after they had just opened up and the attendant at the photo desk saw me with my baggie and had me out the door in no time, saying my refills would be ready in about 45 minutes (for most folks, they can just do their shopping and by the time they’re done, so are the inks). I asked the lady at the counter if people often experience problems with the refills, and she indicated they didn’t and that my cartridge in particular was one of the best for refills. When I came back to get my refills the total was $30.54 ($10.18 per cartridge). I felt like I had gotten a fair deal and essentially paid half of what I would have had I shopped at the retail stores. We’ve been using the cartridges for several weeks now and haven’t experienced any issues. The only thing you’ll likely encounter is that the printer won’t recognize the refilled cartridge, and display a message on the user-interface. You just bypass this message and it soon accepts them. All this got to thinking what else could I be buying off-brand replacements for? I think we get so tied in to that we need to purchase the “name-brand” refills / filters / or spares otherwise it may break. But all of that is a great marketing ploy put together by the manufacturers to get us to spend a little more than we have to. Often these off-brands, are just as good. Of course, Costco and other retailers (like Walgreens) aren’t the only places you can get refills OR remanufacturered cartridges. 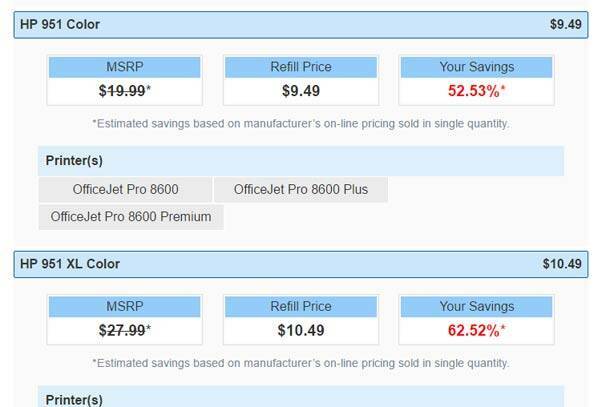 Please let us know how else you save on printer refills! Update 12/19/2016: Now a few months removed from this post and having used the Costco refurbished inks in my HP OfficeJet Pro 8600, I might advise you against using any refurbished ink in your printers. My refurb’ed ink has now gone try and I am getting printer error issues. This could be a common issue with refill ink, so that is something to consider. But even after tonight when I went to the nearby OfficeDepot store where I was about to buy their generic brand for the HP, the associate gave me a good lecturing to not buy the off-brand for the printer saying he sees all sorts of people who choose it only to come back complaining how it ruined their printers, and ask for them to fix em. This stinks, because refurbished inks are a lot less expensive – and for the most part – have worked fine for me during this trial. Just a word of caution if you do decide to go with a refurbished ink. Thanks for all the research you did for buying ink carts…..I always put off buying them even when I know I need to simply because I know it will usually cost me dearly. I made my first purchase from inkcartridges.com yesterday, and as soon as I have it installed I’ll let you know how it’s working!! It was the lowest price by far I’ve ever paid for a cartridge for sure, and the store is also a “Google trusted store”, which means if I do have problems, and they cannot be resolved with the store themselves with complete satisfaction, Google will help out. Yeah! Hi Colleen. Would love to hear about your experience w/ inkcartridges.com!